Your excitement for treehouses started when you were five, and your Dad built you a treefort in your garden. What was it that made you continue with your passion for building in the trees once you graduated from college rather than turning to a career that was a little more main stream? I had long harboured a passion for architectural design and carpentry; I’ve always found it immensely fulfilling to create tangible things and have something real to show at the end of each workday. Treehouses were especially attractive to me because of their relatively short project timelines, as well as their small scale. Designing for small spaces in a short period of time is creatively challenging, but also digestible: I can get my head around the design very quickly. I was also captivated by the challenge of building in a living organism. The promise of stimulating design challenges combined with my deep love of nature made the treehouse life an easy choice. Treehouse construction is truly a labour of love; it continuously ignites and excites me. I became dedicated to making my passion for treehouses my career, and feel deeply grateful that I was able to achieve that. Why do you think people still get so excited by the idea of a treehouse? I think that treehouses remind people of their childhood, since many folks had or played in treehouses as children. The connection between treehouses and childhood rekindles a sense of wonder, playfulness, and adventure in people of every age. Treehouses represent a creative space, where fun often reigns over function, and where visitors are encouraged to dream, explore, and reconnect with nature. I also believe that the elevation of treehouses from the ground enables visitors to distance themselves from the monotony and normalcy of everyday life. This brief separation allows folks to be more mindful of the present and gain perspective on their lives. For these reasons, people view treehouses as peaceful, happy, and essential retreats. How has life changed for the Nelson family since starting Treehouse Masters? Treehouse Masters pushed our small family business to grow and challenged us to produce our highest quality treehouses in very short periods of time. The show has therefore motivated us to become increasingly efficient and to hire extremely capable, self-motivated, and dedicated folks. On a more personal note, Treehouse Masters has taken me to amazing places all around the world; my wife, Judy and I have had the privilege of meeting treehouse enthusiasts across the US and abroad, eating tasty local delicacies from every corner of our country, and exploring other family businesses far and wide. Although the show has often taken me away from my home for months at a time, I’ve been honored to see so much of the global treehouse community; it really is a special group of people. What is the family’s favourite treehouse project? We all loved designing and building my son Charlie’s treehouse in Woodinville, Washington. It is always special to design for my own family, as I am liberated to execute all the whims of my own vision. And it was wonderful to work with both of my sons on the project. Charlie’s treehouse also marked the beginning of my family’s newest project: the Treehouse Resort and Spa. I loved every minute of building on the Treehouse Resort and Spa property, and cannot wait to continue progress on our new nature retreat. As a family business ourselves, we know it’s important to spend quality time with each other away from work too. What does the Nelson family love to do when they are not up in the trees? On our days off, we love to play board games in our kitchen while Judy whips up some delicious delicacy (she’s a trained chef, so everything she makes is scrumptious!). We also love to travel and bask in the natural beauty of the Pacific Northwest; we’ve taken several amazing family backpacking trips. And whenever we’re together, we can’t help but discuss and dream up our next treehouse adventures. What is it about your treehouse journey that you are the proudest of? I am proud and humbled that I get to work with my family every day. I also am so proud that I have the privilege of working with such an incredibly talented, hardworking, and creative group of people. I deeply value how hard all of my colleague’s work, and am excited by the growth of our treehouse endeavours. How do you think treehouse trends in the USA have changed over the years? In a very stereotypically American way, it seems that US treehouses keep getting bigger. Folks are asking for larger, more elaborate treehouses with full amenities. These treehouses essentially function as liveable structures, and push my team to design and build to ever-greater heights. I enjoy this challenge, but also love when I get to go back to my treehouse roots and build more rustic, simple treehouses. 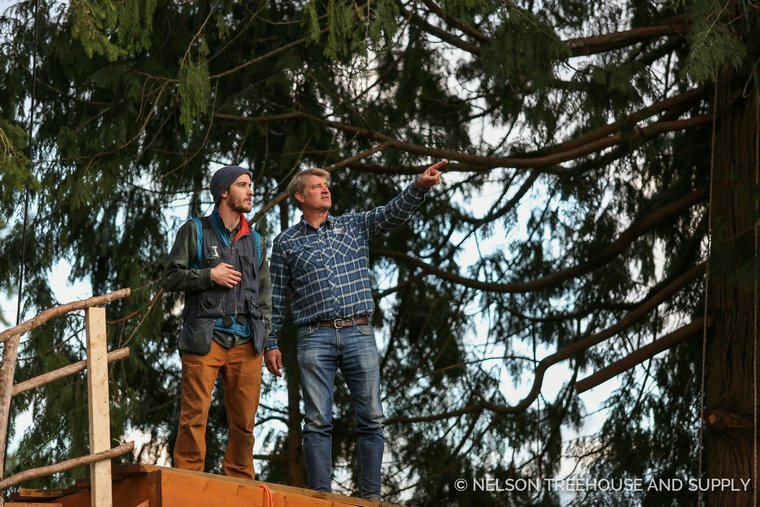 Looking ahead, what does the future hold for Nelson Treehouse and Supply? We hope to continue to provide the highest quality of treehouse craftsmanship that celebrates the talent of our carpenters and the beauty of our materials. We also hope to expand our division of builds for clients who are not featured on TV. Finally, we’re committed to providing ways for everyone to experience a slice of the treehouse life. If someone is unable to build a treehouse, perhaps that person can enjoy a stay in one of our own at TreeHouse Point or Treehouse Resort and Spa. And if someone can’t come to stay, perhaps that person can enjoy reading our treehouse books or exploring our free treehouse content on our blog. We’re so excited about expanding our online presence through our blog, social media, and YouTube channel, as these mediums enable us to connect with every one of our fans. We’re so grateful for everyone’s support, and are committed to making the treehouse world accessible for all. The most amazing treehouse in the world would be……situated high off the ground, on a beautiful piece of property in the Pacific Northwest (perhaps in the stunning San Juan Islands). It would have a little desk where I can draw and write, a small kitchen where Judy can cook, and a really comfy bed for rest. I would love a simple, rustic treehouse that focuses on its connection with the surrounding nature. It’s Not Just A Treehouse. Ten Different Uses for Treehouses & Hideaways.